The Ebbinghaus Illusion is a famous illusion in which the size of dots appears to be different due to the size of the objects around them. The left hand dot seems to be smaller than the right hand dot, but they are, as is expected in a visual illusion, the same size. This property of the brain, to adjust the size of objects in relation to their surroundings, can be a very useful one. When looking at a group of large objects, something that is relatively small should not be perceived as important. Contrastingly, when viewing a cluster of small objects, something relatively bigger should be viewed as more significant and important. Even if the relatively smaller and larger objects are the same, their surroundings decrease or increase their importance respectively. 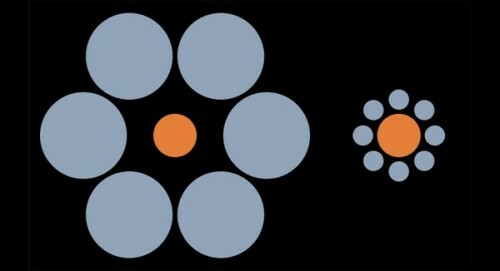 The orange dot on the left hand side is not as important as the same sized orange dot on the right hand side because one is enveloped by bigger dots while the other is surrounded by smaller dots. Perspective, once again, becomes the determining factor when viewing this image. However, the size of the surrounding objects is only half the story. The distance between the central dot and the other dots is also a major factor in the perceived size difference. When the surrounding dots are farther away from the central dot, the orange dot will appear smaller because there is more space between it and the other dots. Contrarily, when the blue dots are close to the central, orange dot, the orange dot appears bigger. These two factors together make the Ebbinghaus Illusion very deceptive. A determining neurological factor in the deceptive ability of this illusion to an individual is the size of their primary visual cortex, or V1, a region in the back of the brain that processes the visual information received from the eyes. The size of V1 is extremely variable from person to person. People can have a V1 three times the size of someone else’s. This leads to different perceptions of the Ebbinghaus illusion. The Ebbinghaus Illusion correctly portrays the “flaw” in our visual system which leads to differential perceptive ability. Without this mechanism, we would focus just as much on the smaller objects in a large group of objects as the bigger ones. With this mechanism, we can effectively prioritize which objects need to be viewed in relation to others. Bigger objects in a group of small objects receive more attention while smaller objects in a group of big objects receive less attention. Interestingly, children under 10, who have lower context-sensitivity (differential perception ability) and thus are not deceived by the Ebbinghaus Illusion. Don’t we all wish we could just be kids again! This entry was posted on Friday, July 25th, 2014 at 5:04 pm and is filed under Optical Illusions. You can follow any responses to this entry through the RSS 2.0 feed. You can leave a response, or trackback from your own site. Bonus: The constant movement of the black and white “figure” in our peripheral vision (while we are focusing on the central letters) leads to optic blurring. The brain perceives this blurring to be correct and carries the blurring over to the next object of sight. This is a really famous illusion and you explained it really well. I especially liked how you mentioned that distance between the dots plays in important role as well. Interesting. I didn’t know that bit about the size of V1 determining how one perceives the illusion. Do you know where that particular bit of information came from? Also, please add your sources! This is very intriguing. I also didn’t know that the size of V1 could determine one’s perception of illusions.